I might as well admit it - I'm a hippie at heart. Not the kind that doesn't shave her underarms and showers infrequently, thank you very much, but the kind that appreciates a macrame owl and peace sign necklace. Case in point: this necklace. 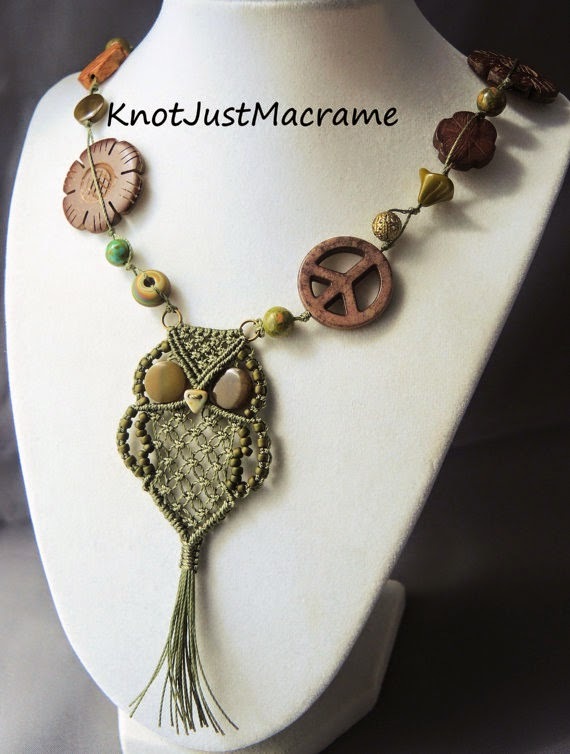 I knotted the micro macrame owl in olive green cord with Tagua nut coin beads for eyes (eco-friendly!) and then I added an eclectic selection of beads to the necklace. 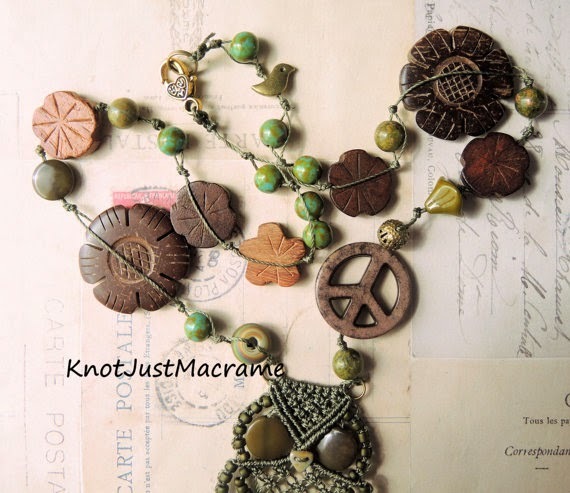 Note the groovy peace sign and the mod carved wood beads. There are some unakite rounds in there, as well as glass, artisan lamp work, and even a little brass bird. And the clasp has a heart on it because we hippies are all about brotherly (sisterly?) love. 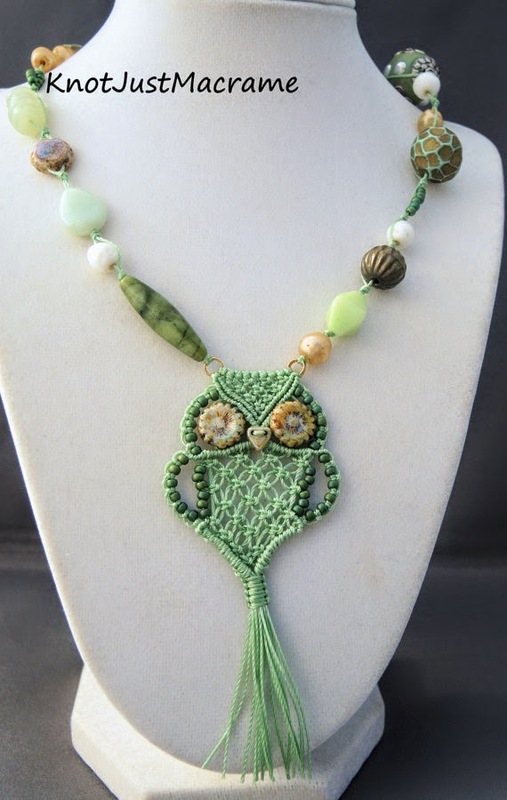 I made this owl when I was fiddling with the Micro Macrame Owl Pendant Tutorial, so I thought I'd make up a necklace for him, too. 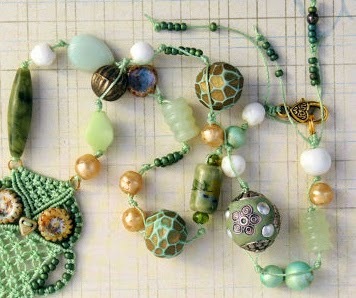 He's done in light sage green cord with Czech coin beads eyes and I added an eclectic assortment of beads including two by Barbara Bechtel of Second Surf, a Bali style bead, some jade ribbed tubes, a pre-WWI Japanese glass diamond, a vintage ceramic tube, Czech glass and more. 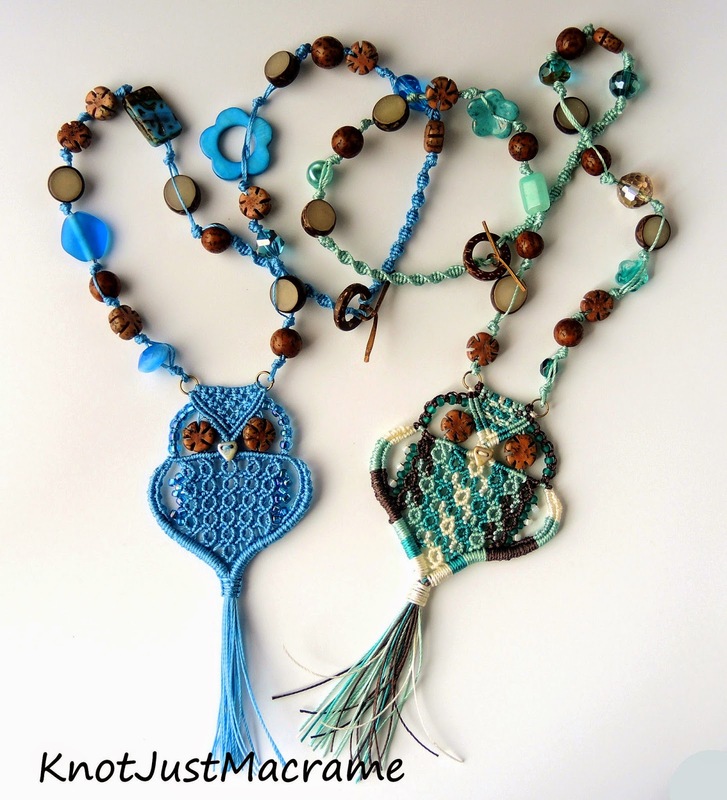 Want to make your own knotted necklace? Once you have your owl pendant (tutorial is available here), it's really simple to make this type of necklace. Here's how: take a good length of cord (I start with probably 4 foot), fold it in half and attach it to the split ring on the owl using a larks head knot (or use an overhand knot if you prefer). 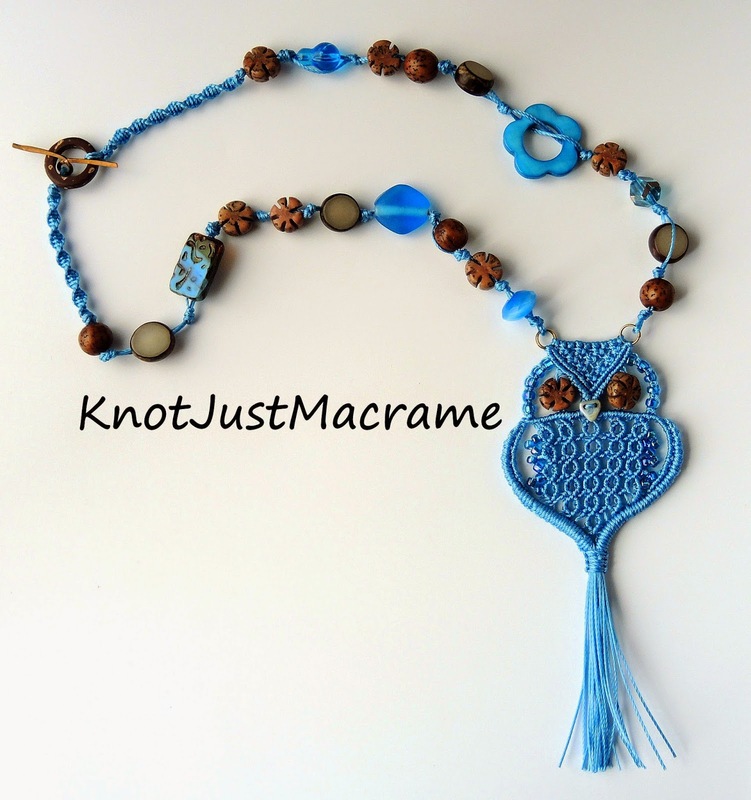 Add your chosen beads by sliding them onto one cord or both (usually depends on how large the hole in the bead is - sometimes only one will fit), and tie an overhand knot after each bead. 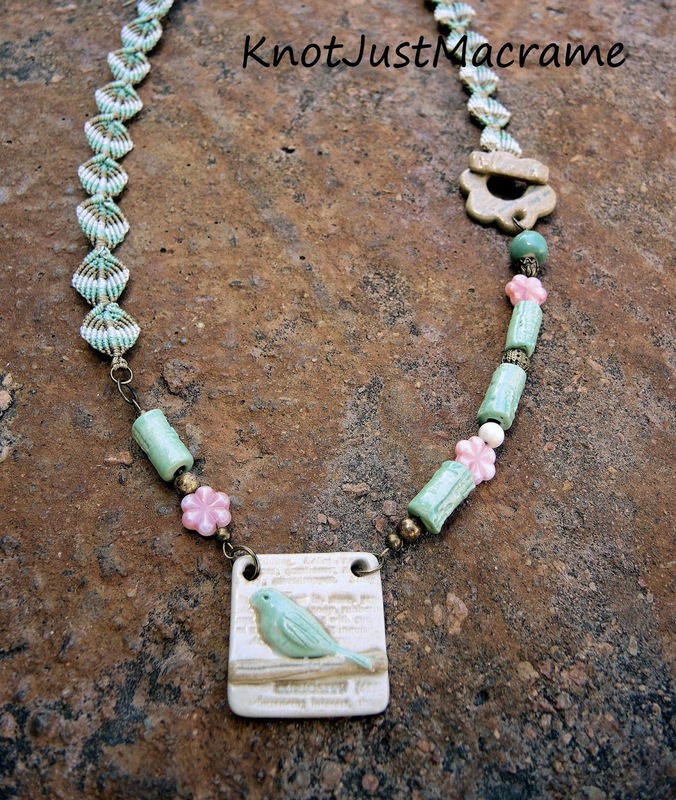 Mix it up a little - add two beads together here and there if you like. No rules (you know how I hate rules!). When you get the length you want, add the clasp of your choice, securing it with an overhand knot. Super simple. Add a dab of glue to the knot and trim the excess cord. Leave a couple inches if you like. 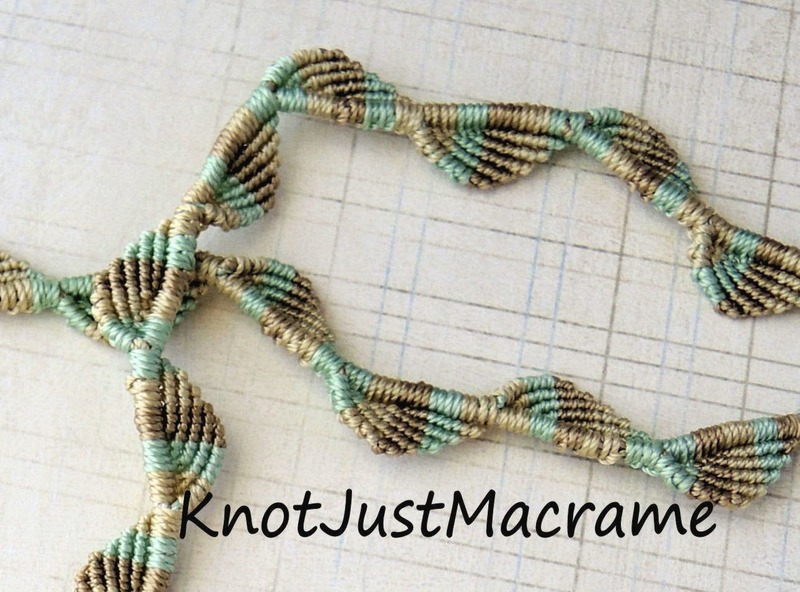 You can also add a few random seed beads on the cord ends. Repeat with another cord through the other split ring. Done! 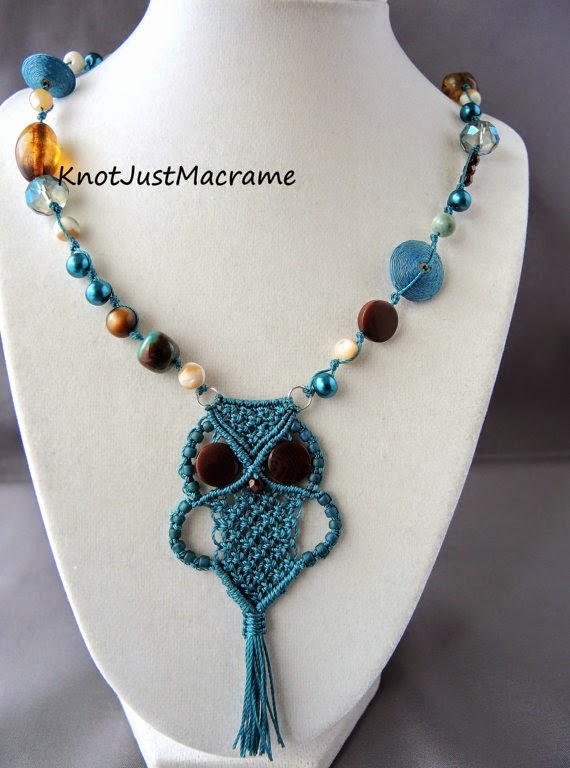 And yes, you could make this style of knotted necklace without the macrame owl - but why? Yay! Do the happy dance, folks (or maybe the Hustle would be more appropriate! 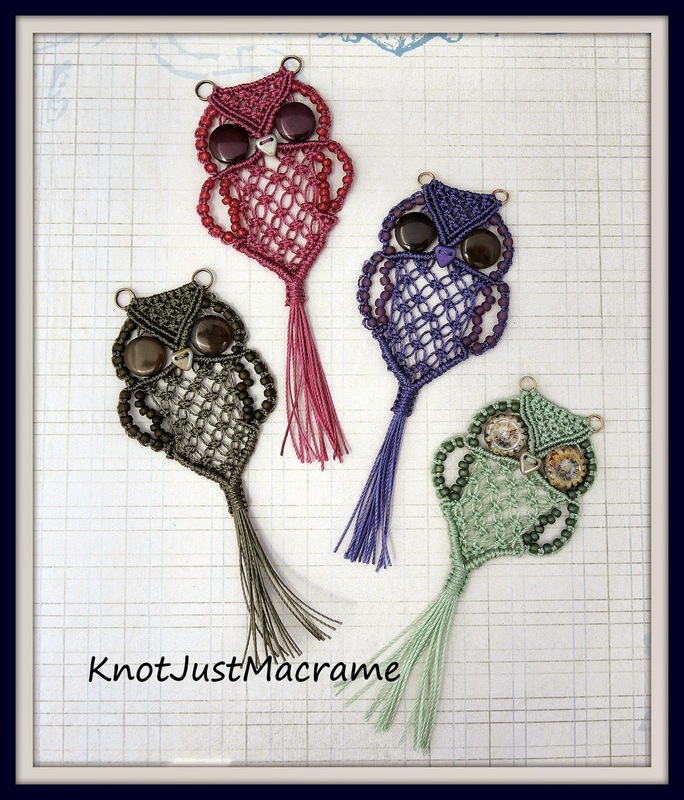 ), I finally finished a tutorial for the retro 1970's macrame owl pendant. I've included a materials list and 64 photos in 23 pages of step by step instructions. There is a whole post on different ways to make the larks head knot here and the double half hitch is covered in this post. And those three knots should get you through this tutorial. This isn't a hard pattern, but it does have a couple of more "advanced" maneuvers that might not be the best for someone who hadn't ever tried micro macrame. If you fall into that category, you might want to start with something a little easier like the Micro Macrame Braids Bracelet. 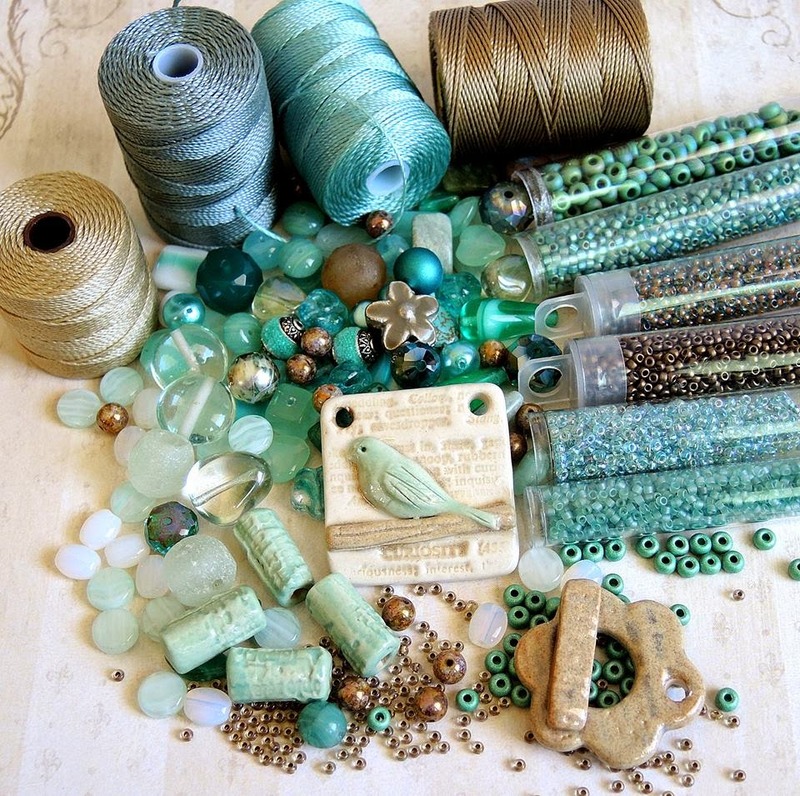 And don't forget, there's a free class at CraftArtEdu.com that covers the basics like tools and materials, as well as a whole selection of classes for you including bracelets, earrings, a watch and a necklace! But back to the owls. Aren't they adorable? That's a whole rainbow of them up there! 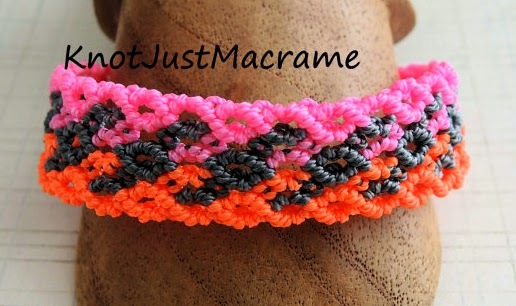 If you haven't tried micro macrame yet, what are you waiting for? Neon is a fun trend this summer. I've seen all kinds of new neon beads, and best of all - neon bead cord! 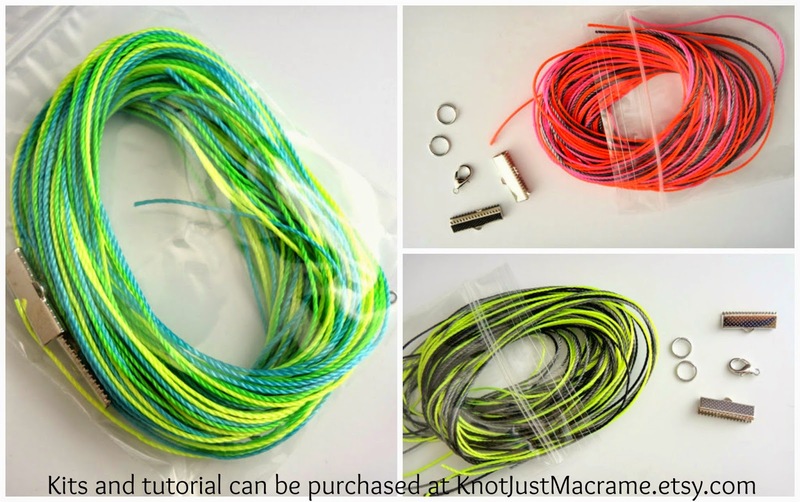 Both C-lon and Superlon have come out with neon cord in four colors and it's available in both the regular size (.5mm) and the heavier Tex 400. I chose the Tex400 and started playing around with the Micro Macrame Curves Tutorial. 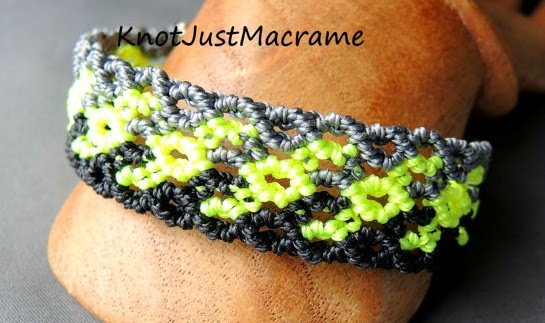 For the bracelet shown above, I combined the neon yellow and neon green with aqua cord and I really like the result. The brighter neon colors elevate the aqua to the point where it almost looks like neon also. Then I combined neon orange with neon pink and ran a dark grey down the center to ground the colors a bit. 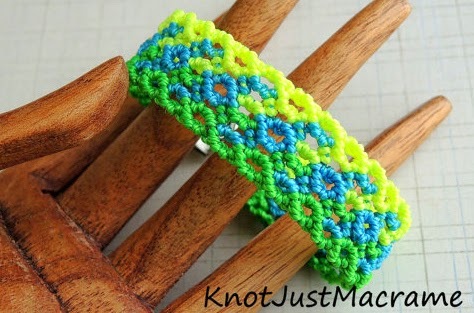 Both of these bracelets scream summer! I also experimented with adding just one neon element. For this next one, I used grey and black and then just a pop of the neon yellow. Thankfully my knotting ability is better than my photography skill - these really do look better in person. In my defence, the neon cord is really bright! 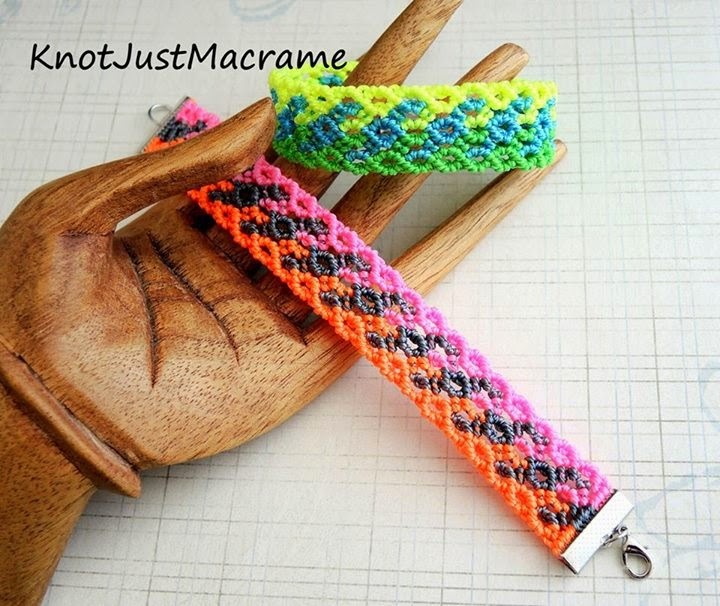 For all you "do it yourselfers", if you'd like to try your hand at making your own neon macrame bracelets, you will find the tutorial and DIY kits for all three of these color combinations in my Etsy shop.